"Disciple of the Heinous Path"
Far from any reinvention of the wheel, SARGEIST's "Disciple of the Heinous Path" is a good example of well-written, old school, Norwegian-inspired black metal that just happens to be played by Finns. Morbid guitar melodies and primitive riff tones abound, and a natural drum sound, Torog's strained croak-vocals, and a fog-covered aura combine for a compelling experience. Considering the crackling riffs heard here, it is hardly a shock that SARGEIST's cold heart and blackened soul is that of HORNA guitarist Shatraug. The skillfully selective use of pace-change is one of the album's most notable qualities, "Cursed Blaze of Rituals" and the title track examples. Both feature frightful sections of lumbering misery that give way to up-shifts in tempo, painting a mental picture of being dragged face first along a rocky path, then grabbed by the hair and thrown off a cliff. That is not to say that certain songs do not strike hard and fast, such as album-opener "Black Treasures of Melancholy" and the eight-and-a-half minute "Remains of an Unholy Path", the latter about as good as it gets when it comes to riding a bleak groove to demonic glory. The key throughout is the dreadful feeling one gets from a tortuous riff or a grooving death-gallop, both present at every turn on "Disciple of the Heinous Path". Don't be fooled into thinking that the most convincing forms of primal black metal savagery are simple to create, a mere matter of recording a live session on a jam box and pressing a few hundred CDRs. 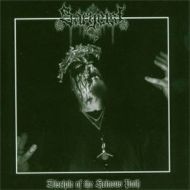 The creation of fear through a sound mix that is of sufficient quality to ensure clarity, yet still trampled and dirt-caked, is what SARGEIST has captured on "Disciples of the Heinous Path". It is an understatement to say that the market is flooded with cheap imitation black metal and one-man band wannabes. Those seeking a vintage sounding and effectively arranged album of grimness would do well to take a chance on "Disciple of the Heinous Path".